I’m a little late in my Merry Christmas and Happy New Year. I was planning on some time off from blogging over Christmas to enjoy my family all being home, but never got the chance to let you know. I got sick with this flu and cold that’s going around on Christmas Eve. I was really disappointed, since I had lots planned over the holidays which seemed to all be replaced with rest, lots of NyQuil, and tv watching. I wasn’t the only one down in my family, but at least we were together. I’m feeling much better now, and wanted to share this little drink I made for a party right before I got sick and didn’t get a chance to share with you. 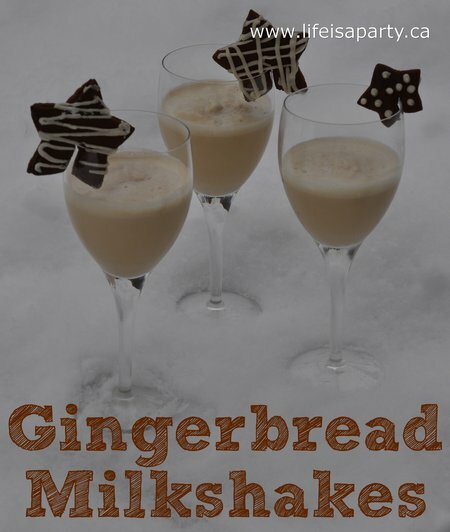 I made the ginger syrup and used it to make some gingerbread martinis for the grown-ups and these fun gingerbread milkshakes for the kids and non-drinkers. 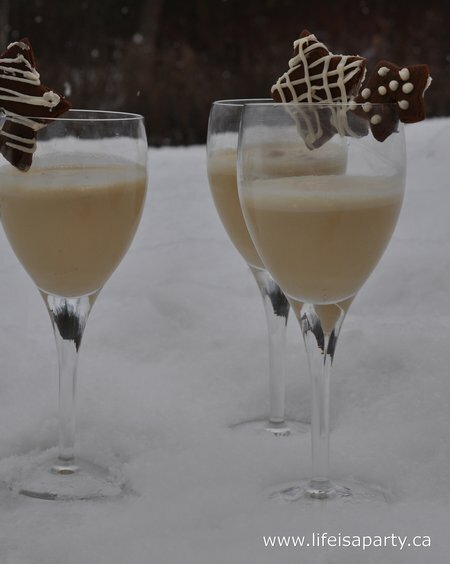 Become a facebook follower of Life is a Party to see the Gingerbread Martini recipe -it was a real hit too! My girls really loved the milkshakes. You can also use the syrup to make gingerbread lattes at home, so there’s still time to make up a batch and enjoy it during these snowy January days and nights. Start off with making the gingerbread syrup. 1. Combine ingredients in a saucepan, and bring to a boil. 2. Simmer for 25 mins. 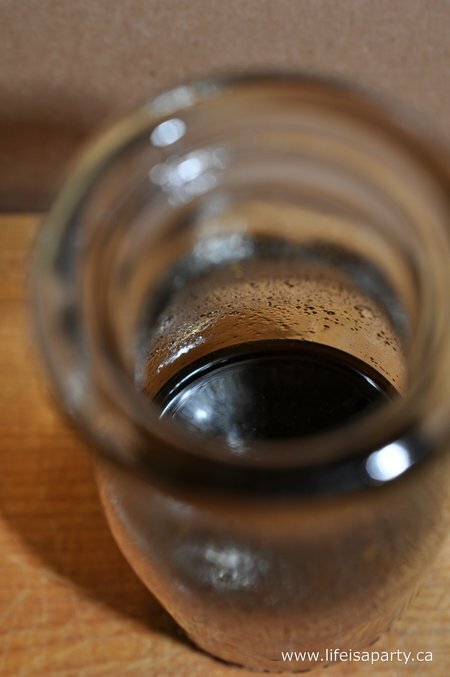 Strain into a bottle and let cool. Combine in your blender and blend until smooth, serve with gingerbread cookie on the side (cut out a small slit in the dough before baking so it can fit over the rim of a glass). It’s pretty easy and your kids will seriously think you’re a rock star -the fancy glasses impressed them too. 😉 With gingerbread milkshakes, life really is a party! This post is linked up at Craftberry Bush, Tatertots and Jello, Six Sister’s Stuff, Twigg Studios, I Heart Nap Time, and French Country Cottage. 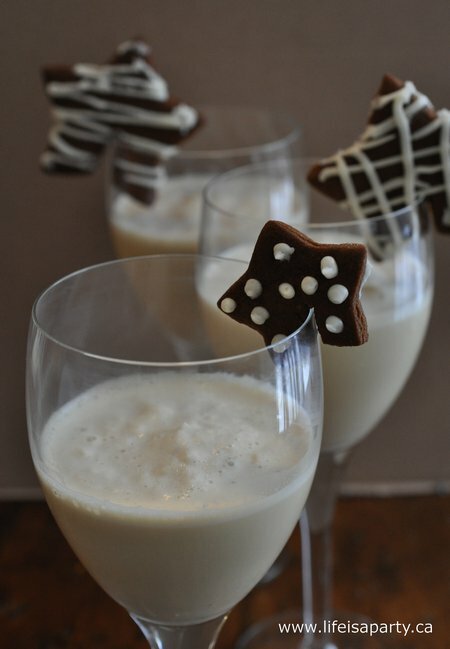 I’ve never thought to try gingerbread milkshakes. What a great idea! I love gingerbread cookies, and you can’t ever go wrong with ice cream. Thanks so much for sharing. We’ll be trying these tonight.